Notch Mountain is a narrow, elongated, fairly flat-topped peak extending nearly 3 miles west to east, with a prominent dip in the middle - The Notch, at elevation 10,600 feet; the twin summits at either side rise 660 feet higher. 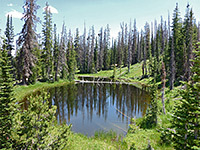 The mountain lies at the center of a very scenic and relatively easily accessible part of the Uinta range, on the northwest side of Hwy 150, surrounded by woodland and granite basins containing several dozen lakes, and the views from the top are quite spectacular. There is no path to the summits, though either side of the peak can be reached by a steep scramble up the scree slopes to the south, however the views are still very good from the main official trail in this region, to the Notch, starting at the Crystal Lake trailhead, reached by a short side road. 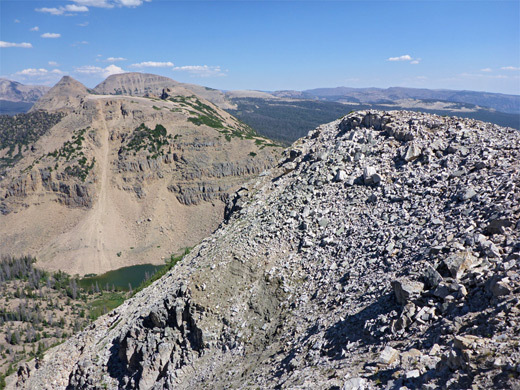 This route passes four named lakes (Lily, Wall, Hope and Twin), plus a number of lesser ponds, while climbing fairly gently, in four stages, and reaching the Notch after 2.5 miles. Another path from the same trailhead also heads north but moves more to the west, passing a different, larger set of lakes (Crystal, Cliff, Petit, Linear, Watson and Clyde), before fading away, though it is simple enough to walk northeast another half mile over fairly flat, open land and connect with the other route just below the Notch. This allows a loop (to the Notch) of 5 miles, while an extension to include the western summit adds only another mile, and this is the hike described below. 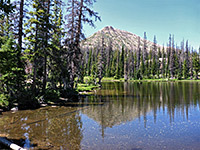 For shorter hikes, the main destination is Wall Lake along the eastern trail, reached after one mile. 21 views along the Notch Mountain Trail: gallery, slideshow. 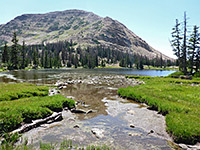 Panorama of John Lake. Full screen version (24 mb). Crystal Lake is part of the second busiest location along the highway, after Mirror Lake. A fully paved side road leaves to the north on the outside of a bend beside the upper reaches of the Provo River, and, after several junctions with spurs to other lakes, ends at quite a large parking area 400 feet from the edge of Crystal Lake, just after the USFS campground beside Washington Lake. Like all such parking areas along the highway, a fee is charged for day use. Two trails start at the far end of the parking area, both initially heading west; one goes just a short distance, to Washington Lake and the south side of Crystal Lake, but the main route, more northerly, leads to many destinations. This trail divides very soon; the branch on the right is initially to the two Lily Lakes, and forms the return part of the Notch Mountain loop, while the other path continues straight on, passing a little pond and running across lightly wooded slopes a short distance above Crystal Lake to the west. Another junction at the far end of the lake is with the Morehouse Trail, to Long Lake and other places further west, as the main trail continues northwards, rising through more light woods and patches of white granite, briefly becoming quite steep then flattening again as it approaches Cliff Lake, which is lined by and named after a low escarpment on the far side. 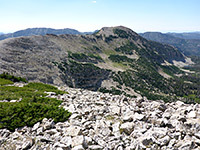 If climbing the mountain, the most direct route is north from John Lake; over a little flat area then directly up the scree slopes, which are formed of jagged white boulders partly covered with lichen, generally firmly set, so there are no great difficulties apart from the steepness, though neat the top are a few dense patches of stunted pines that may be a little problematic to pass. The ground levels out abruptly at one of two summits on the western side of the mountain, 11,206 feet; the other is 52 feet higher, and 0.7 miles distant. The mountain top is home to a different set of flowers than those found lower down, such as the bright purple sky pilot. The views are of course very extensive, and include dozens of lakes and many other peaks, closest being the other half of Notch Mountain, which is somewhat steeper and has fewer trees on its upper slopes. The shortest way down, to connect with the path to the Notch, is southeast, along the edge of the ridge, but this is quite difficult owing to the steep, rocky, overgrown terrain, so the best route is back the same way, down the scree slope. The path south from the Notch descends a little to a nearly level area, crosses sparsely wooded flats east of the Twin Lakes, then drops down again, while veering more to the east to avoid several bands of low cliffs. It passes several ponds and the small Hope Lake, followed by a sharper descent to more tree-lined ponds along an eastern tributary of Wall Lake; a pretty place that seems to be the upper limit for many of the hikers from Crystal Lake. 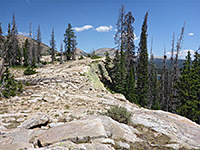 The path proceeds through the forest to the edge of Wall Lake, one of the largest in this part of the Uinta Mountains. The shoreline is a popular place for primitive camping, especially to the south. The trail divides shortly before a footbridge across the exit creek, also at the south end of the lake; left is the official Notch Mountain Trail, leading to an alternative start point along the highway beside Trial Lake, but the route back to Crystal Lake is the right (west) path. This traverses a steep, wooded slope of tall trees, descending gently above a deepening valley, and passes between the two Lily Lakes which are indeed home to many yellow-flowered pond lilies, most especially to the east. The trailhead is a few hundred feet beyond.